Knickernappies: The Importance of producing American Made Products and the benefits. Lately in the cloth diaper industry it's become less clear which products are made in the USA and which are not. Some manufacturers clearly state that they are and some don't state anything at all leaving consumers to do their research and investigate on their own. While it's a known fact that foreign outsourced products can be manufactured and obtained at a cheaper cost and sold at a cheaper retail price point, what exactly are consumers sacrificing in order to save a couple bucks and is it really worth it? Is buying American made products important to you? Knickernappies is committed to providing it's retailers and customers with quality American made products and I had a chance to talk to Heather, the owner of Knickernappies about why it's so important to them and what the future might hold for the Knickernappies brand. Below are her responses to some of my questions. Have Knickernappies products always been made in the USA? Our products have always been made in the US, with the exception of our new Baltic amber teething necklaces which are made in Lithuania where the Baltic amber is collected. However our sewn products (diapers, inserts, nursing pads, etc) have always been made in the US. This includes all of our inserts, which most other diaper manufacturers make overseas. But since we are so committed to US-only production 100% of our inserts are made here in Oregon along with our diapers and other products. Why is it so important to you that your products are USA made and remain USA made? The number one reason we want our products made entirely in the US comes down to relationships. We have a close relationship with our sew shop and we know each person who sews our diapers by name. In good conscience, I simply can't do anything to jeopardize their jobs. Once, we ran out of thread and production stopped. Three ladies were working that week. All three were sent home. They all three in turn had to send home their babysitters. Altogether, there were 6 people who didn't get paid that week because we ran out of thread. That made it very personal to me to make sure those ladies always have jobs. Not only do I make sure that our production stays in the US, but now I make double sure we have plenty of thread! Additionally, it's very important for me to have a direct influence on quality. If a shipment of fabric looks funny, or the elastic isn't quite right, I can be at our sew shop in 10 minutes, inspecting things personally before anything is sewn. I couldn't possibly do that if our products were made overseas, or even out of state. Where are the products made (city/state) and by whom? All of our sewn products are made right here in Springfield, Oregon, near where we live. Terry and Julie own the shop and do most of the sewing. They also have several ladies who sew for them and work exclusively on our products. Cutting, sewing, and snapping are all done on-site. It's a very clean shop, with lots of windows and flowering plants. It's an enjoyable place to be and we actually spend a lot of time there. Even our daughter enjoys visiting (though that might have something to do with the candy bowl on the counter!). What does the future hold? Do you ever see Knickernappies wanting to move manufacturing outside the USA or is this something that you will not seek? At this time, we have no plans whatsoever to produce sewn products overseas. We did just add Baltic Amber teething necklaces that are made in Lithuania, but since that's also where the amber itself is found, it makes sense to have the necklaces made in the same country. Plus, Lithuanian artisans are the best in the world for cutting and polishing amber and creating necklaces. 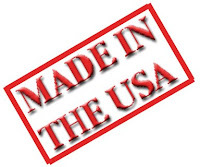 How important is it to you that you buy American made products? Only when it's convenient or is it something that you make a priority? What are the main reasons you buy American made? We'd love to read your comments! That is just one of the many reasons we love Knickernappies. It is so important to support the American economy and keep jobs here. We have also been pleased with the quality of sewing. I sew myself, so I really scrutinize the workmanship on diapers I buy. You make the only one size dipe I will recommend to friends. Buying American is very important to me! That's one of the factors that drew me to Knickernappies (my first KN's are on their way to me right now!) It's important for all the reasons that you mentioned above, but also because it keeps American dollars within the American economy, and that's something we need really bad right now. There won't be new jobs for people that need them if we keep buying goods that aren't made here! I can personally attest to the wonderful customer service and involvement in the quality control process. There was some minor stitching flaws in a new loopy do I had. I contacted KN's and she sent me a replacement right away. One of those had the same minor flaw in it. It was still going to be usable but I wanted her to know just because she seemed interested to know what was going on with the product. She then sent me another replacement and went searching for an answer. She found one and let me know what the deal was. I have never had this level of customer service from any other CD retailer. I like to spread the word about their awesomeness any chance I get. 1) of course, keeping American dollars and jobs in America--one of the reasons why we are in this economic hole is because we started sending jobs overseas! I am a proud American, and want to do whatever I can to support our great country. Your point about building local relationships is spot on. To strengthen our communities and keep dollar cascading through our economy, we need strong small businesses and entrepreneurs. It is their effort that creates most of the new jobs in America. Imported goods are flooding the shelves of even small retailers like gift shops and galleries. American consumer purchases drive two-thirds of our economy so how we choose to spend our money really matters. Let's make this the year of the American gift!